This workbook offers practical strategies for helping families of individuals with psychiatric disability to better understand their roles in the recovery and rehabilitation process. 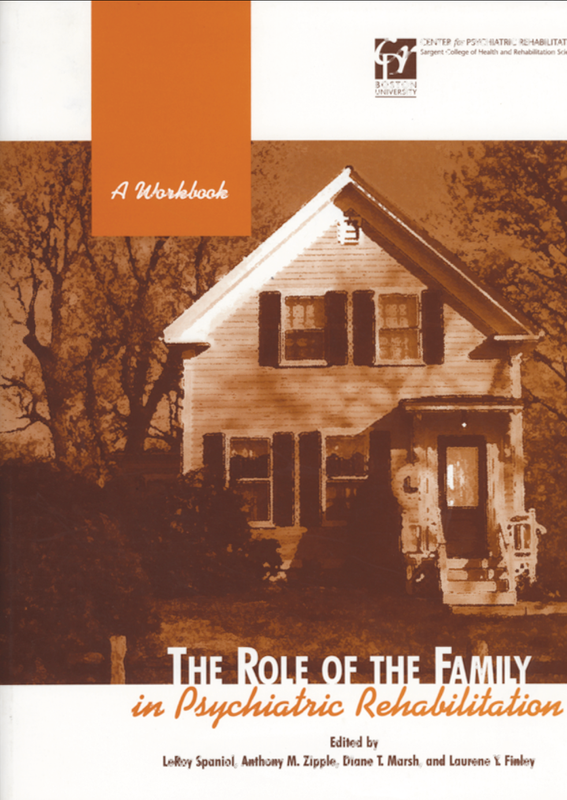 The Role of the Family in Psychiatric Rehabilitation: A Workbook describes the experience of having a family member with a psychiatric disability, and the multiple and changing roles that family members can play in the psychiatric rehabilitation process. The family members experience of loss and their process of recovery. How to meet the many needs of young family members. Practical coping strategies for family members. How to help family members manage stress. How to deal with confidentiality issues. The cultural context of coping with a family member with a psychiatric disability. Strategies for collaborative relationships between family members and mental health and rehabilitation professionals. Citation: Spaniol, L., Zipple, Marsh, D., & Finley, L. (2000). The role of family in psychiatric rehabilitation. Boston, MA: Boston University Center for Psychiatric Rehabilitation. Anthony Zipple, ScD, MBA, is Chief Executive Officer for Thresholds. Dr. Zipple has worked with community mental health programs for almost 30 years as a clinical manager, public administrator, consultant, teacher, researcher, and executive. Dr. Zipple holds a Doctor of Science in Rehabilitation Counseling from Boston University, an MBA from the University of New Hampshire, and MS and BA degrees from the University of Notre Dame. He is a licensed psychologist and has authored over 60 articles, book chapters, monographs and books on topics related to community mental health. He serves on the Editorial Boards of Psychiatric Rehabilitation Journal and Psychiatric Rehabilitation. Previous positions held by Dr. Zipple include Chief Operating Officer for Vinfen Corporation (Cambridge, MA), Director of Doctoral Studies for Boston University’s Rehabilitation Counseling Program, and Senior Research Associate at the Center for Psychiatric Rehabilitation. Dr. Zipple was the winner of the 2004 John Beard Award of the International Association of Psychosocial Rehabilitation Services for outstanding contributions to the field of psychosocial rehabilitation. Diane T. Marsh, PhD, is Professor of Psychology at the University of Pittsburgh at Greensburg. The author or editor of 12 books, she has many years of experience as a therapist, consultant, and trainer. Dr. Marsh served as chair of the American Psychological Association Task Force on Serious Mental Illness and Serious Emotional Disturbance and as APA representative on the American Bar Association Task Force on Mental Disability and the Death Penalty. She received the Catherine Acuff Congressional Fellowship for 2003-2004 and worked in the office of Sen. Jeff Bingaman. Laurene Finley, PhD, is a Licensed Psychologist and former Assistant Professor in the Department of Psychiatry, Division of Behavioral Healthcare Education at the Medical College of Pennsylvania and Hahnemann University (now Drexel University) where she taught for 15 years. Currently, she is on the faculty of the PRIME Institute (Partners Reaching to Improve Multicultural Effectiveness) at Drexel University, College of Medicine, Behavioral Healthcare Education. Dr. Finley has been recognized as a cultural competence consultant and trainer within psychiatric rehabilitation and behavioral healthcare organizations. She served as Project Director for a 3-year, Workforce Research and Training Grant to Reduce Racial and Ethnic Mental Health Disparities funded as one of four national models by the Substance Abuse and Mental Health Services Administration (SAMHSA). Dr. Finley has received special recognition from the Pennsylvania Association of Psychosocial Rehabilitation Services for her outstanding state contribution to the development of cultural competence in psychiatric rehabilitation and the distinguished career award. She served on the editorial board of the Psychiatric Rehabilitation Journal. She’s been a member of the USPRA Certification Committee and published professional journal articles and chapters in multiculturalism, psychiatric rehabilitation and mental health. She is a frequent workshop presenter.